Art Fits Vermont is this year's statewide community arts project presented by the Vermont Arts Council and its partners. With 60,000 puzzle pieces distributed statewide, each decorated puzzle piece becomes an individual work of art that can potentially connect to other pieces of the puzzle from one end of the state to the other. Art Fits Vermont will last through July 2009, when the Vermont Arts Council will hold the culminating event, a giant PuzzlePalooza, to be held in conjunction with the Lake Champlain Quadricentennial Celebration. Linda Whelihan, local arts educator, has created an Art Fits kick-off for Brattleboro in February with a series of events on Gallery Walk night, Friday, February 6. "The idea of bringing together a wide array of community members in a project with the theme of connectivity really appealed to me. With my background in the schools, student art was a natural place for me to start," Whelihan said. The River Garden will be Puzzle Central, with an artist reception and exhibit of student work from Brattleboro Union High School (advanced studio, fundamentals, and diversity classes -- two examples are shown here), Brattleboro Area Middle School, Leland & Gray, and The Grammar School. In addition, other area artists and community members will have puzzle pieces on display. For hands-on puzzle fun, Beadniks has donated supplies for jewelry-making with miniature puzzle pieces. Whelihan adds, "Drummond Biles, a senior at BUHS who works at Beadniks, is captain of the Nordic ski team. He's organized a jewelry-making event to support the team." The ski team will have some ready-made puzzle jewelry available for a $5 donation. 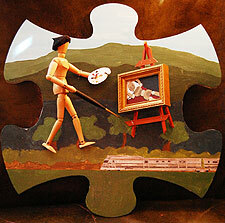 Vermont Arts Council's ArtMobile will also be on hand for puzzle-related activities. Starting Gallery Walk night and continuing through the month of February is the Art Fits Scavenger Hunt. 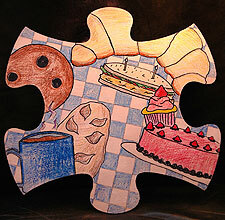 Downtown businesses have decorated puzzle pieces to represent themselves (here are two of those for you to identify). 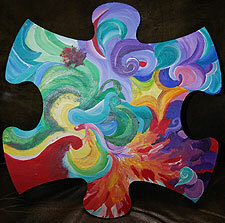 These pieces of puzzle art will be displayed in each others' businesses. The public is invited to pick up a scavenger hunt form and match the business with the correct puzzle piece. Forms are at the Brattleboro Museum & Art Center and the River Garden. Prizes will be awarded at the end of the month for three of the correct submissions. "It's not too late to get involved," says Whelihan. 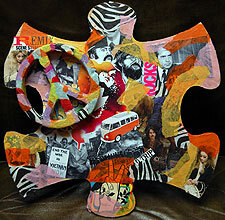 "There's room for many more pieces of puzzle art at Puzzle Central. Painting, sculpture, found objects, anything that will fit on a 15"x15" puzzle piece can be part of our big connection between the community and the arts." Blank wooden puzzle pieces are still available at Vermont Artisan Designs and Brattleboro Arts Initiative, Room 112 at the Latchis. Contact Linda Whelihan at l.whelihan@comcast.net for more information.